A recap of the end of the main event at Extreme Rules plus the return of Seth Rollins. Seth Rollins heads to the ring. He seems excited to be back. The crowd is excited to see him as well. He talks about firing the first shot at taking back the title he never lost. The crowd chants for him. Rollins finds that interesting. He recounts how he was booed and called a weak champ by the crowd. He talks about the tweets, flowers, and fan mail that he got while he was injured. He burned all the fan mail. He’s going to win back his title, and he doesn’t care what the fans do. Roman Reigns heads to the ring. When he enters Rollins leaves. Shane McMahon then comes out and all three men get in the ring. He gets right to the point and gives Rollins a title match at Money in the Bank. Renee Young asks Sheamus about facing Sami Zayn. Sheamus thinks Zayn’s name is funny and his hat is stupid. This felt like a pretty quick match, but it was good. It felt like Sheamus was too confident and didn’t take Zayn seriously, but Zayn also had a really good showing against his much stronger opponent. They worked well together. Also, I really like how Sami has been using the Helluva Kick lately. New Day wishes RAW a happy birthday, but Big E is concerned about the cake. As he teases throwing the cake in someone’s face, the Social Outcasts attack New Day from behind. With their attack prior to the match, I thought the Social Outcasts might have a chance in this match, but it was a squash. It was fun, but it was super short and only contained a few moves. Heath Slater never tagged out, and New Day had no problems whatsoever. After the match New Day points toward the cake at ringside. Big E wants to eat it, but Kofi and Xavier have other ideas. They explode the cake in Heath’s face. The Miz gloats about retaining his title at Extreme Rules by overcoming the odds just like in Rudy. Good match. Cesaro’s shoulder injury came into play, but otherwise this was a fine Cesaro television match that Miz happened to be in. Renee Young welcomes Seth Rollins. Rollins thinks it would be fitting if he got his title back at Money in the Bank. Stephanie McMahon shows up. She says it’s great to see Rollins, but that their business relationship has changed. Rollins is disappointed, or maybe confused. Pretty good match. Crews looked a little rough at times though. In one particular spot it looked like he was supposed to kip up to avoid the Lionsault, but he actually got hit when he got to his feet. Renee Young asks Sheamus about his reaction to Apollo Crews losing. Sheamus just laughs and walks away. Bob Backlund tells Darren Young that notes are for kids in school. He then starts to recite all the presidents in order. He also disapproves of Young’s language. Jojo welcomes Baron Corbin. He talks about beating Ziggler, but Ziggler walks up and tells Corbin that he can’t beat him in a technical wrestling match. Corbin says he just beats people up. Big Cass comes out to the stage and brings out the returning Enzo Amore. They talk about how the Dudley Boyz have been out of line. A pretty good match. Bubba made Big Cass look good. It was pretty one-sided. D-Von and Enzo had a bit of a confrontation outside the ring that lengthened the match, otherwise it would have been even shorter. Charlotte, Ric Flair, and Dana Brooke head to the ring. Ric congratulates his daughter for retaining the title. Charlotte thanks herself and tells her she made correct decision by joining her. Charlotte then recounts her childhood, a childhood where her father was always gone. Now that she’s champ, she understands. She’s the woman. And now that she is the woman she has the courage to tell her father to get out f her ring. She says that she’s not Ric Flair’s daughter, Ric Flair is Charlotte’s dad. She doesn’t need Ric anymore. He’s dead to her. A good match (other than Ambrose basically no-selling a superkick by rebounding with his rope-bounce clothesline). It wasn’t the show-stealing match the Ziggler told Corbin it would be, but it was a solid TV match. Arn Anderson tries to comfort Flair as he leaves the arena (with Titus O’Neil and Zack Ryder in the background). 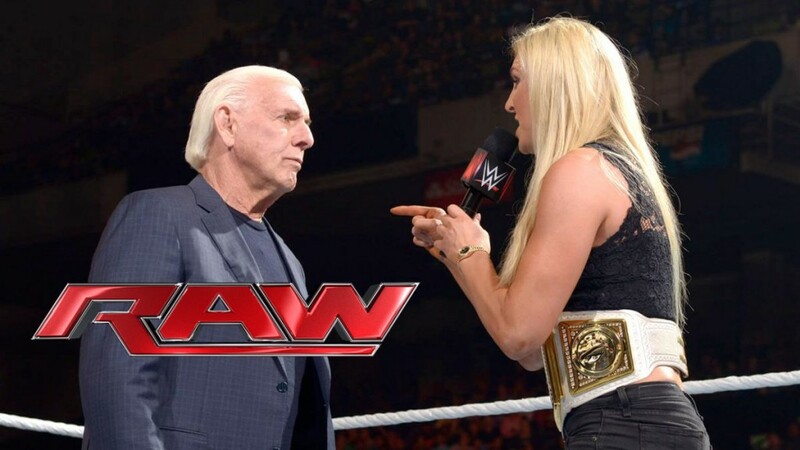 Renee Young gives Flair a chance to respond to Charlotte, but he doesn’t. Primo and Epico sends a special invitation to the WWE Universe. Visit Puerto Rico. AJ Styles heads to the ring and says that if it wasn’t for the Usos, Gallows, and Anderson he’d be champ right now. But he’s not, so he’s focused on his chance to enter the Money in the Bank match. Gallows and Anderson interrupt. They are upset that Styles included them in the reasons why he didn’t win at Extreme Rules. They tell Styles he’s changed. Styles just wants to separate professionally. He says they’re still brothers, but he wants to make it in the WWE on his own. Gallows and Anderson don’t like that. Anderson says they are neither brothers nor friends anymore. Great match! There are many great things in this. There was a little bit of one-upsmanship going on with Styles and Owens doing similar moves to each other. Both guys pulled off some spectacular moves (like Styles with a springboard 450 and Owens with a double-jump moonsault). It was very physical. This pairing should be a world title feud. A good show. The matches were mostly good and/or fun, and I always like a night of qualifying for something. The Rollins segment wasn’t particularly bombshell-dropping, but I like the result. And Charlotte’s segment was surprisingly good. This was better than most of the matches on Extreme Rules last night. Great match.